Pvt insurance firms face challenges after leaner, fitter and more profitable from the 2008 meltdown, but challenges remain. Private insurance companies have emerged leaner, fitter and more profitable from the 2008 meltdown, but challenges remain. Amitabh Chaudhry was faintly amused. It was early 2010 and a consultancy firm had got in touch asking if he would consider taking over as CEO and Managing Director of HDFC Life. The 50-year-old, a graduate of Birla Institute of Technology and Science, Pilani, and an MBA from the Indian Institute of Management, Ahmedabad, had headed Infosys' Business Process Outsourcing (BPO) arm and been in banking earlier, but had never worked in insurance in his life. He wondered why on earth HDFC Life - a joint venture between HDFC Ltd and the UK-based Standard Life Insurance - was interested in him when he knew almost nothing about the sector. But it was too good an offer to refuse. "The first question the board of directors asked me was how long it would take me to make the company one of the country's top three private insurers," he says. "I replied it would be at least three to four years." HDFC Life was then the fifth-largest in terms of premium collection. Chaudhry has delivered on his promise - HDFC Life is now the second-largest in terms of total premium after ICICI Prudential Life Insurance Company, according to March 2014 data. Sticking firmly to the 'revenue is vanity, profit is sanity' dictum, he has reduced the number of HDFC Life branches from 595 in 2008/09 to 429 in 2013/14, the number of employees from 14,506 to 13,900 and the number of financial consultants - read insurance agents - from over 200,000 to around 75,000 in the same period. But at the same time, the company which recorded a loss of Rs 243 crore in 2007/08 - and indeed had been losing money since it was set up in 2000 - showed profits of Rs 271 crore in 2011/12, Rs 451 crore and Rs 725 crore in the two subsequent years. Chaudhry was not the only outsider inducted into the industry around that time. So too was Jayant Dua, CEO and MD of Birla Sun Life Insurance till October 2013 - he came from the insulator manufacturing business, taking over in July 2010. Indeed, private life insurance saw a great churn at the top around this time. Shikha Sharma quit as CEO and MD of ICICI Prudential Life Insurance to take over at Axis Bank; her successor V. Vaidyanathan also left soon after to explore an entrepreneurial venture. 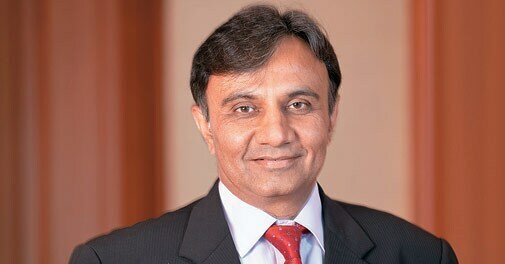 Sandeep Bakhshi, a one-time banker who built the general insurance business for ICICI, then took charge. Reliance Life Insurance, Bajaj Allianz Life Insurance, Max Life Insurance and others all saw their top executive change. The new managers have delivered on profits, but premium income has flattened out and in fact declined in the last three years . Overall, private life insurance companies - which began only in 2000 after the government allowed limited foreign investment in the sector - have been able to acquire 35 per cent of the business at the cost of Life Insurance Corporation of India, the public sector behemoth which enjoyed a monopoly till the turn of the last century. But how sustainable are these profits? Most private life insurers maintain the quality of the business they are underwriting now is significantly better than it was up to 2008/09 when premium income seemed to be growing exponentially. It is primarily because unit-linked insurance plans (ULIPs) are no longer in vogue and traditional term insurance plans have made a comeback. 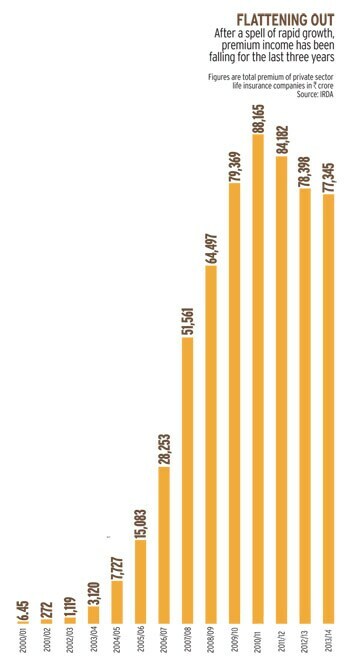 Even up to 2010, ULIPs comprised 83 per cent of the market; they are now down to 28 per cent. "Traditional plans tend to have more persistency than ULIPs," says Anuj Agarwal, CEO and MD, Bajaj Allianz Life Insurance. They declined once the insurance regulator, the Insurance Regulatory and Development Authority (IRDA) imposed stringent conditions on their sale - increasing the minimum lock-in period from three to five years, curbing agent commissions as well as the charges that could be imposed if policies were surrendered before the lock-in period ended, and insisting the sum assured should be at least 10 times the annual premium. Their commissions shaved off, agents no longer push ULIPs as aggressively as before. Insurance companies too have had to rethink their strategies with IRDA strongly discouraging them from using penalties for premature discontinuance of policies as a significant revenue stream. 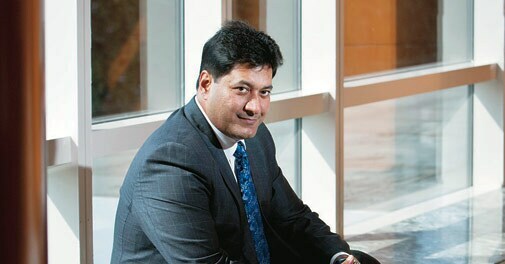 "The new regulations have squeezed margins a bit," says Rajesh Sud, CEO and MD of Max Life Insurance Company. "The profitability of the industry is going to be different from what it was in the past. The challenge is how do you grow your business, how do you penetrate more and increase customer conversation without increasing cost and remaining within the parameters of the permitted product design." 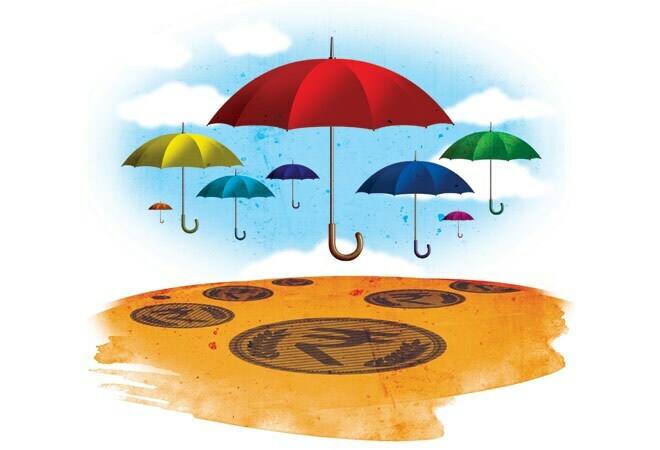 IRDA wants private life insurers to draw their profits in other ways - from the size of assets under management, sale of products, persistency of policies, etc. "The intent of the regulator is clear," says Bakhshi of ICICI Prudential. "Profits should be sustainable over the long term and beneficial both to the company and to society at large." He believes this will be a boon in the long run. "The consolidation phase has made both products and processes of private life insurers stronger," he adds. "Growth in the next couple of years will be much more sustainable." Some believe the boom in the stock market following the coming of the new government could revive ULIPs once more. If an investor has to choose between investing in ULIPs or mutual funds, he has every reason to opt for the former - lower charges, tax incentives with life insurance thrown in. "The cost structure of a ULIP product is very low," says Agarwal of Bajaj Allianz. "If you compare a ULIP product with a mutual fund scheme, the former straightaway kills the latter." Bajaj Allianz claims its Future Gain - a ULIP product - deducts a charge of just 1.35 per cent, while most mutual fund schemes take two to 2.5 per cent. But others maintain ULIPs are done for, having acquired a dubious reputation after the way they were misrepresented by some agents in the past. It was in fact customer complaints about hidden charges and unexplained fine print in the ULIPs sold to them that partially prompted IRDA to act. If private life insurers' bottom lines are improving now, it is because of policy renewals rather than new policies being bought. (In long term life insurance policies, there is no profit in the first year premium, due to the commissions and expenses involved, but these reduce over successive years.) By now, most private life insurers have built a critical mass of policyholders and the business is paying back. SBI Life Insurance Co. Ltd, for instance, earned a total premium of Rs 10,740 crore in 2013/14 of which renewal premiums contributed Rs 5,673 crore. ICICI Prudential Life earned Rs 12,430 crore from its premiums in the same year of which Rs 8,669 crore came from renewals. Cost efficiencies are also contributing to profits - private life insurers have begun to utilise their branches, employees and agents better. In the 2001 to 2008 period, many of them added agents indiscriminately, and this supported the initial growth. But now the dominant means of distributing life insurance products is tie-ups with banks and other corporate channels. All the big insurers are generating more than 50 per cent of their premiums through low cost banking channel. "Breaking even is also faster with a low cost banking channel," says a private insurer. 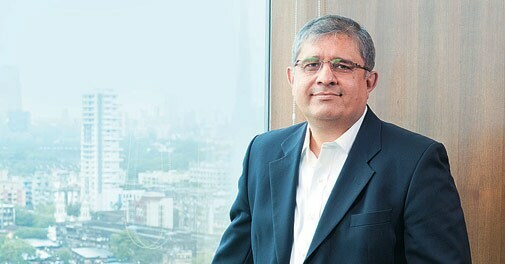 Pankaj Razdan, who took over at Birla Sun Life last October, believes the relationship-based agency channel will be the dominant one in the future. "Insurers will start investing in agency model." Selling insurance policies online also offers further scope for cost rationalisation. "The ecosystem is gradually developing," says Bakhshi. "Insurance products are being simplified. It is also now possible to do KYC (know your customer) authentication online." Not everyone agrees. "It is gradually increasing but is still not big enough," says Agarwal. "The total premium mobilised through online sales, including that of LIC, is just Rs 300 crore annually, which is too small." But all are agreed that the potential is immense. How IRDA's future interventions play out also remains to be seen. "The industry should be nimble-footed and adapt to regulatory changes which are good for the customer," says Bakhshi. For post 2008 managers like him and Chaudhry, the worst is over. But bringing back growth remains the biggest challenge.